Complete information on School Uniform Policy 5300 can be obtained in printable format. School Uniforms will be required for all Preschool through Eighth Grade students for the start of the school year. Where will I be able to purchase uniforms? 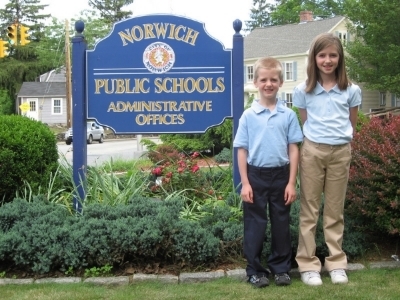 School Uniforms is required for all Preschool through Eighth Grade students. Navy blue or khaki colored jumpers, skirts, (not more than 3” above the knee) pants or knee length shorts, sized to fit the student. Shorts may be worn from April 1 to November 1 only. Pants and shorts must be “dress” or “docker” style. No jeans or cargo shorts may be worn. Blue blouses must be worn. Blouses must have a collar and may be button down/oxford or polo style. Blouses must be tucked into pants or shorts. Hem must reach to waistline when arms are raised. Sleeves may be long or short. No tee shirts may be worn. Sweaters or sweatshirts without hoods or pockets are optional, but if worn must be solid in color or contain the school insignia or name. Footwear that causes noisy distractions, high heels which can cause safety hazards or footwear which causes marks on floors are not permitted. Navy blue or khaki colored pants or knee-length shorts. Shorts may be worn from April 1 to November 1 only. Pants and shorts must be “dress” or “docker” style. No jeans or cargo shorts may be worn. Blue shirts must be worn. Shirts must have a collar and may be button down/oxford or polo style. All shirts must be tucked into pants or shorts. Hem must reach to waistline when arms are raised.